This is a guest post by Thom S. Rainer. Thom is the author of the bestselling books, I Am a Church Member and Autopsy of a Deceased Church. His daily blog is ThomRainer.com. If you want to guest post on my blog, check out my guest post guidelines and submit your post. The year was 1985. My third son, Jess, was five months old. His older brothers, Sam and Art, were five and three years old respectively. My wife, Nellie Jo, and I were exhausted. She, in particular, seemed never to rest with the demands of being a stay-at-home mom to three preschool boys. I was sleeping little as well, dealing with the demands of being a full-time seminary student, serving as pastor of a small church, and working an additional thirty hours a week at a bank. Bonus Content (from Jackie): Want to be a great leader outside and inside your home? 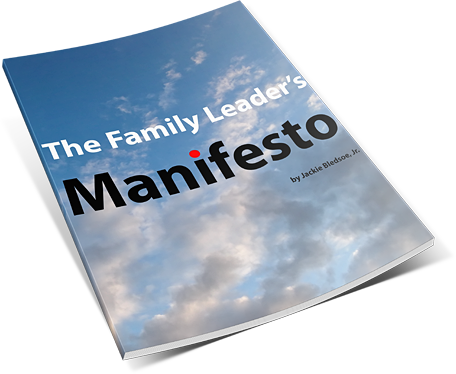 I’ve written a short manifesto for you called: The Family Leader Manifesto. Be on the lookout for it at the end of the post, or Click Here to Grab it Now! I decided to take a break in my studies one evening and picked up a magazine. I was captured by a reprint of a prayer by General Douglas MacArthur. The prayer was MacArthur’s prayer for his son. Throughout the prayer, he repeated the phrase “Give me a son.” He would then expand on how he hoped God would shape his son. The prayer captivated me. I was concerned about my sons. I wasn’t sure I had the mettle and godliness to be the type of father I needed to be. I loved those boys so much, and I had been pleading with God to protect them and to shape them. But in one of those moments that is both indefinable and rare, I sensed that God was telling me something very clearly. My first prayer should not be about my sons, but about me. God gave parents the role of shaping and influencing the lives of their children. I knew that I was the leader God had placed over our family. I needed the help. I needed the prayers for me. So I took MacArthur’s prayer, brought out my electric typewriter, and begin to write my own prayer. The major change I made was to pray for me as a father instead of asking God to make me sons according to my desires. When I was done, I took the paper and placed it in a cheap frame. That prayer has remained close to me ever since. Indeed if you walk into my office today, you will see the cheap frame and the typewritten prayer. Thank you for the personal privilege of sharing this 29-year-old prayer with you today. Make me the father, O Lord, who will show my sons the strength to face weakness; the courage to face fear; the grace to accept honest defeat; and the humility and gentleness to accept victory. Make me the father who will show my sons not a path of ease and comfort, but the ability to accept the challenges of stress and difficulty. Use me, I pray, to be the example of one who can stand up in the storm, and there learn compassion for those who fail. Make me the father who will teach his sons the value of a clear heart and a high goal; to look in the mirror of their own faults before they find fault in others; to learn to laugh, yet never forget how to cry; to reach into the future without ever forgetting the past. Make me the father, O Lord, who will show my sons enough of a sense of humor, so that they will always be serious, but never take themselves too seriously. Give them humility, so they will always remember the simplicity of true greatness, the open mind of true wisdom, the meekness of true strength. And after all these things are theirs, add for me, I pray, the wisdom to show them the dubious value of titles, positions, money, and material gain; and the eternal value of prayer, the Holy Bible, a Christian home, and a saving relationship with Your Son Jesus Christ. Note from Jackie: My prayer for every dad reading this post is that while we hope our sons will become more like us, we strive to become more like our Father, our Heavenly Father in the way we love and lead our sons. 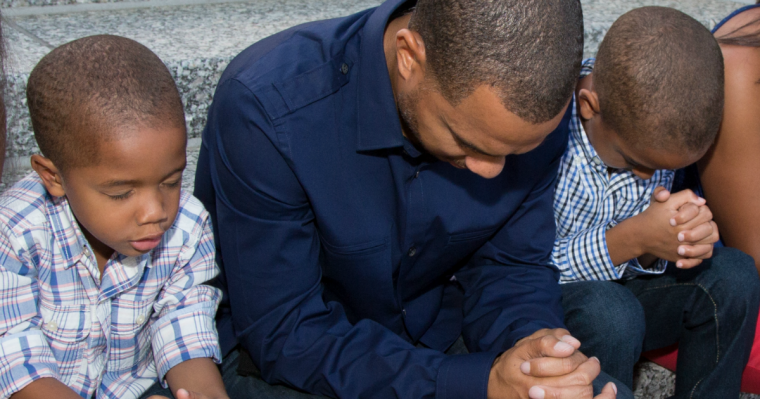 Question: What is one thing you are praying about for the relationship with your sons (or daughters)? You can leave a comment by clicking here. Bonus Content (from Jackie): Want to be a great leader outside and inside your home? I’ve written a short manifesto for you called: The Family Leader Manifesto. In it I share 3-sure fire strategies that will help you assume and excel at your most important leadership role. This manifesto is short, easy to read, and easy to implement.